It is copyright © Manuel Brito and Jacket magazine 2009. See our [»»] Copyright notice. 1) a high degree of syntactic and verbal fracturing, often treating the page as a structural frame; 2) use of found materials, cutting-up borrowed texts; 3) a focus on rhythmic noun phrases, bop rather than incantatory, with semantics definitely soft-pedaled but not inaudible; 4) a hyperextension of syntactic possibilities, more Steinian than surreal; and 5) philosophic lyrics. Ron Silliman speaks of a new sentence as a form, which brings us to the problem of representation underlying this author’s poetic philosophy; for example, its autonomy, non-fixed relationships, dissolution within the text and its metaphoric function that casts light on the differences and similarities between those who approach the text. These are but samples of the intellectual problems of representation, reference and mediation mechanisms that he has posed, as have his colleagues of the same generation. When David Antin straightjackets Silliman’s style within the description “collage technique” it is precisely Silliman who rejects such a classification, because that technique is of little interest in re-examining the relation of objects with the world they are produced in. That is, it has no political aim to criticize the role of these objects, while this is in fact one of his main intentions. Apart from this, the fragmented sentence is a worthy representative of our modern society with its complexity and multitude of possibilities on offer, making a linear perception of it almost impossible. So why not celebrate juxtaposition and ambiguity, letting them take the place they deserve in our way of seeing and creating the world around us? The sentence cannot be codified either, and therefore is not compatible with predetermined forms because of the poetic tradition whose instrumental function is a response to something imposed on the author. Thus the variety of forms becomes an obsession about using a line more than twice in a row. These details can frequently be seen, showing constant verse transgressions, which formally and diaphanously establish the impossibility of definition. Each uncompromising line and text function as an exploration of the diverse social questions intrinsic to our modern age, involving each individual. Most of his poetic production displays this tendency to take notes reflecting his immediate reactions, in sentences taken down at a penstroke. Some of these numbered verses contain more than one sentence, some do not complete what he meant to say to himself, others reveal more profound reflections. The numeration itself would involve schematics if it weren’t for some of the later numbers lacking sentences altogether. We thus see experimentation, transgression, a going beyond what literary behavior is supposed to be. The final impression is that we are left with a selection of the paradoxes that pass by unnoticed in our daily lives. The poem as space is not just a projection of endless sentences with which to engineer categories or equivalences, nor even wholly surrealist—I again draw attention to their close attachment to reality—nor of course a reductio ad absurdum despite their disconnectedness. It is all much simpler if we realize that Silliman returns over and over again to the minuscule, to the little details that pass by inadvertedly, with the clear intention that the sentence should appear as a stimulus where the subject is shaken, to become more aware of the fallacies of predetermined meanings. Apart from the importance of the sentence in Silliman’s poetics, to “methodologize” and find the fundamentals of its use also serves to avoid both the obvious and the vague emitted by the many pseudo-critics who have approached his work. Simple arbitrariness or randomness and the vital role of the reader, are noticed by all of them, without realizing for example that despite the mathematical form given by using the sentence under the Fibonacci series method, an apparently formless structure is created. This leads to a different perception of form as an organism where all elements tend towards a common end (or ideology), as popular in the Black Mountain poets, and in Modernism itself. Such a work without form that must be reconstituted by the Other. To be more practical, we could outline the mode of sentence interweaving and composition in his texts, that contradicts the apparent arbitrary nature of many of his poems and exemplifies an almost mathematical articulation in sentence use. The method I am referring to is not always adopted by him but rather was used as an experimental medium to explore the enormous possibilities offered by what he calls the “new sentence,” most particularly in Tjanting. In this case, as he himself would say, “the intervention of forms into the real” really began in an earlier book, Ketjak, where the sentence acts as a nuclear unit with each paragraph having twice the number of sentences as the previous one and where, despite the repetition of sentences that simulates an atmosphere of cohesion, we are really made aware of the present immediacy of each sentence or paragraph we read rather than its linear development. In Tjanting, Silliman uses a Fibonacci series and begins with a few sentences that are propagated into the following paragraph and become mixed with others. We could almost speak of a spiral sentence arrangement, giving rise to a series of paragraphs, progressing: 1, 1, 2, 3, 4, 8, 13, 21, 34… where each paragraph contains the sum of the sentences in the previous two. In this way, what began with only two sentences will end with extremely long paragraphs whose most obvious feature is the recovery of what has been noted before; playing with factors like memory and multirelationships or the obvious fact that there are too many gaps between words. Of about to within which. Again & again I began. The gray light of day fills the yellow room in a way wch is somber. Not this. Hot grease had spilld on the stove top. Nor that either. Last week I wrote “the muscle at thumb’s root so taut from carving that beef I thought it wld cramp.” Not so. What then? Wld I begin? This morning my lip is tender, desfigurd. I sat in an old chair out behind the anise. I cld have gone about this some other way. Ron Silliman writes sentences in these paragraphs without apparent connection, plays with several words by omitting a few letters, and informs us of an experience peripheral to us. One of the rooms is supposed to be yellow and unlit, that he has been cooking something and lacks skill in handling the knife and fork and then ends up with a glass of anise in the porch of his house. But these sentences can also be interpreted as “ghosts of evidence” as he himself calls them in another part of this book, to draw attention to the nature of language. Why bother to debate if the hot fat is connected with the meat and slicing it has given him the pain in the thumb, if at the end of these two paragraphs everything changes and leaves us with a new perception on observing that “I cld have gone about this some other way.” The experience of reading Tjanting is unlike the detective role necessary from Modernism to the seventies in order to find out an ultimate final meaning, which usually revolves around the subject-author. Now as Barrett Watten states clearly in the introduction to Tjanting, what we call “error” disappears and the above quoted sentences considered earlier as idiosyncrasies are now essential mediating terms of the text. All this has reached the book by way of his notebook where he had collected momentary realities and thoughts immersed in his daily life. Nearly all the books of poetry written by Ron Silliman are made up of long poems and a succession of prose stanzas we might rather consider as paragraphs. Both the language and the images or reflections become juxtaposed, progress and break up. I accept that this technique can get close to “collage” but in Silliman’s work this combination of prose and verse is not intended to approach fiction, as he is not interested in inventing, but in initiating discussion, in order not to appear as a simple consumer of conventional repetitions. As Marjorie Perloff notes while extrapolating Wittgenstein’s concept of philosophy: the result is a discourse that leads towards the limits of language and is always subject to revision. The poetic prose he uses is without the conventional references of Aloysius Bertrand or Baudelaire but has the deep roots of an autobiography that tries to train and awaken language itself. For Silliman, style is no more than a name for strategies adopted in placing a key term inside the sentences around which the others revolve. With the superimposition of sentences he finds the form capable of uniting synchronic with diachronic, of transforming themselves into paragraphs, stanzas or lines always facilitating contrasts and connections within the writing itself. dip mid-flight into the valley. Big sun sizzles & spits. These three sentences, as with all the others in Manifest are decontextualized and serve to question the importance of the meaning or our and the author’s intentions. Therefore, more than looking at an epistemology in use we will pay more attention to recognizing that we are faced with a formal structure (paragraph / three sentence stanza) that disseminates the urgencies we are accustomed to. In fact, when Silliman speaks about prose in his essays (“New Prose, New Prose Poem,” “Towards Prose,” “The New Sentence,” “I Wanted To Write Sentences”) he is not only suggesting a form of discourse that adheres to narrative, but that he always tries to get over or erase that threshold set by literary genres, favoring a “prose poem [which] merely reconstellates, redistributes, interiorizes those features by which we know poetry when we see it.” What is more, Silliman warns in ‘The New Sentence’ about the difficulty of defining the sentence, because areas like linguistics, philosophy and literary criticism have all made incursions into this without reaching consensus; one only has to refer to the Oxford English Dictionary, to find nine entries. As a radical curiosity he also makes reference to Milka Ivic, Trends of Linguistics, published around the thirties, who found that 160 different senses had been proposed by linguists. Parting from these difficulties he works with the sentence to question or elucidate not so much the role of the ‘I’ as the writer-reader relationship, as reflected in ‘Sunset Debris.’ Before referring to the concrete definition Silliman himself offers for the ‘new sentence,’ let us say that the reifying character of language, where established human relations now appear as immutable laws due to habit and time, is what Silliman wishes to transmit to us to illustrate that the poetic text or material has a use and exchange value in society, i.e. they are subject to power relationships. In both poetry and prose, the sentence subverts convention and takes up responsibility towards the connection literature-society. Consider his rhetorical question formulated at the New Poetry Colloquium in Vancouver: ‘What is more deadly than a poem which seeks to be told that it’s beautiful?’ Poetry for him, responds to and gives rise to enigmas like the role of subjectivity, directions to be taken by decontextualization, the social context of poetic material and ruptured rules of grammar and syntax which otherwise normally operate in favor of the political system. Despite the multitude of definitions of the sentence by linguists, Silliman joins them by observing the new sentence has its origin in Barrett Watten’s poem “Chamber Music,” published in Decay, and it is “a decidedly contextual object… is the first prose technique to identify the signifier (even that of the blank space) as the locus of literary meaning. As such, it reverses the dynamics which have so long associated with the tyranny of the signified, and is the first method capable of incorporating all the levels of language, both below the horizon of the sentence and above.” Much later, around 1993, another Language poet—Perelman—defines the new sentence as “more or less ordinary itself but gains its effect by being placed next to another sentence to which it has tangential relevance.”Perelman follows without doubt the same parameters that Silliman had noted in his essay “The New Sentence” in which to arrive at this proposition, he makes a wide detour. I would like to mention some names as forerunners of, or significant for his concept of prose poetry and its core element, the sentence. The references are quite varied and dispersed through time, beginning with William C. Williams and continuing with Milka Ivic, Saussure, Leonard Bloomfield, Chomsky, Volosinov, Wittgenstein, Quine, Wellek and Warren, Machery, Todorov, Barthes, Rossi-Landi, and Gertrude Stein. Together with these are numerous examples of poets who approach or deviate from the new sentence. The most obvious conclusion is that grammatical analysis of any structure greater than a sentence is almost impossible. Within it we most easily recognize the objects, images and their many meanings. There, we are obliged to individually perceive all kinds of combinations produced inside it and also those giving rise to its contact with other sentences. This last is also relevant to prose-poetry. I have already referred to the juxtapositions of words which may arise within the sentence, causing ambiguities and destabilization of the relation between signifier and signified; it is no less so that a combination of this type of sentences makes numerous possible interpretations for the dislocations and different allusions formulated. Silliman calls this mode of operating with contrasting sentences “syllogistic movement,” by means of which the mind reads immediately and automatically, interpreting new data (with each new sentence) without it having any disjunctive meaning. This technique has a parallel in advertising language and even in journalism, where pains are taken to avoid possible contextual gaps still making isolated allusions or quotes. Related with this we must not forget that a variation in form greatly used by this author is the long series poem, which connects appropriately with plenty of examples in the American literary tradition. We could mention a few, ranging from Walt Whitman’s Leaves of Grass to Robert Duncan’s “Passages” or “Structures of Rime,” without forgetting Ezra Pound’s Cantos, Paterson by William C. Williams, Louis Zukofsky’s A, or Charles Olson’s The Maximus Poems.Silliman contributes to this tradition with his series generically titled “The Alphabet” containing books published dispersedly (normally by small presses), where the first letter of each title is part of an alphabet still being assembled. The reader’s attitude to this kind of poems has always raised several questions, for instance in the case of many earlier authors the series was truncated by the author’s death and therefore left unfinished. Secondly, their writing corresponded to a whole life and reflects a clarifying of interests and directions taken. Also however, metaphorically, the final impression is that the poem can be completed and will continue to be written by others, thus it is still present with us. Silliman is sure the total series will complete the twenty-six letters and probably all the different sections will be published after his having passed away. His interest is not in producing a poem that will be cut off by his physical disappearance but to try and transmit the textual density produced with the syllogistic movement between poems of the same book, and at the same time the dialogue established between the different books in the series. For him the emphasis falls on the new sentence as the most significant unit, through polysemy and syllogistic movements that question the limits of language and our identifications (not our identity), by means of deconstructing the poetic material when faced with the impossibility of controlling the multiple references of such a chain of contrasting signifiers. Instead of the accustomed metaphors or meanings we must disentangle, the primary question is the writing process, which brings our attention back to the text and to ourselves. For Craig Watson the dynamic structure of the typical poem written by these poets is a product of the I “tension of the text in which all units are equal… no sentence is more important than any another.” I particularly think that these concepts function at the level of poetics and have generated numerous subsequent definitions that emphasize the instability of meaning. Let us take up George Hartley’s as example, proposing that the so-called new sentence does not exist, rather that the same sentence by itself “functions as the spacing between desire and fulfilment,” however we must recognize that some of the poems produced under these parameters, might rigorously be accused of joining sentences that swallow each other up hypnotically, without aspiring to more than to philosophize abstrusely. This same difficulty in grasping truths occurs not only in the sentence but also in some words used significantly by Silliman for the title of two of his books. The word “ketjak” is for Stephen Fredman a Balinese song recited by the monkey extracted from the Ramayana, whose form pattern would be repetition and variation (in agreement with Silliman’s intentions in Ketjak), and “tjanting” is interpreted as an instrument to draw with in Batik techniques (in this Fredman coincides with Watten). The word “tjanting” obviously also functions as another phonetic spelling of “chanting” and so this oral character would contrast with a text that prefers to return to the written. For David Bromige on the other hand, “ketjak” means a chattering or screeching of monkeys and “tjanting” the same Batik tool. The third version (Silliman’s) suggests that “ketjak” is a Balinese choral music form of the Ramayana legend, recognizing it is also the Balinese word for monkey. The same confusions in meaning are reproduced in another of Silliman’s ambivalent titles: Lit,short for literature, a pun on “illuminated,” “enlightened” or “on fire.” It is clear that there is no homogeneity, but at the poetic level the consequences are clear for our perception of reality and by extension that of language. Its value is not exclusively literary but markedly social, obliging us to value the instrumentalization of language and the reason for a “correct” use of it. One of the greatest emphases made by Silliman is on the capacity of language to include or exclude individuals and through this social dimension, he distances himself from the modernist writers, e.g. Gertrude Stein, whose play on words within the sentence or the relationship of the words with objects have their correspondences in our mental functioning. In this sense, Silliman’s inclusion of jargon, opaque words, juxtapositions or layerings, palindromes, homophones, neologisms and anagrams involves, uncertainties in meaning but also the awareness of the mediating role it plays in our attitudes to life. Bob Perelman, “Parataxis and Narrative: The New Sentence in Theory and Practice,” American Literature 65.2 (June 1993): 315. Larry McCaffery & Sinda Gregory, “An Interview with Ron Silliman,” Alive and Writing(Urbana: U of Illinois P, 1987) 251. Ron Silliman, “Terms of Enjambment,” The Line in Postmodem Poetry eds. Robert Frank and Henry Sayre (Urbana: U of Illinois P, 1988) 183. Larry McCaffery and Sinda Gregory, “An Interview with Ron Silliman,” Alive and Writing(Urbana: U of Illinois P, 1987) 254. Tom Beckett, “Interview,” The Difficulties 2.2 (1985): 34. Ron Silliman, “Sailboat,” This 7 (Spring 1976): n. pag. Ron Silliman, Tjanting(Great Barrington: The Figures, 1981) 11. See Rob Wilson quoting Fredric Jameson on this matter in “Reading Ron Silliman’s Barton Bart: Serial Syntax and Paradise,” American Poetry 5.2 (Winter 1988): 35. Marjorie Perloff, “Toward a Wittgensteinian Poetics,” Contemporary Literature 33.2 (Summer 1992): 196. Ron Silliman, “From Language Writing,” L=a=n=g=u=a=g=e 5 (October 1978): n. pag. Ron Silliman, Manifest (La Laguna: Zasterle, 1990) 10. Brooke Horvath also raises the question of the extent to which the status of prose-poems is due to a poetry that gradually gets to be seen rather than heard. In any case, it is obvious that the prose-poem erases the distinction between poetry and prose as he himself illustrates with examples ranging from French authors to Robert Bly or Charles Simic. “Why the Prose Poem?” Denver Quarterly 25.4 (Spring 1991): 107. Cfr. Ron Silliman in Julia Blummerich and D. Martin, “Interview,” Paper Air 4.2 (1989): 88. Ron Silliman, “Statement for the New Poetics Colloquium, Vancouver, 1985,” Jimmy & Lucy’s House of K 5 (November 1985): 19. Ron Silliman, “The New Sentence,” The New Sentence (New York: Roof, 1987) 92-93. Hereon I use the following abbreviation on referring to this work: TNS. Bob Perelman, “Parataxis and Narrative: The New Sentence in Theory and Practice,” American Literature 65.2 (June 1993): 313. Ron Silliman, “For Charles Bernstein Has Such a Spirit… ” The Difficulties 2.1 (Fall 1982): 106. Craig Watson, “The Project of Language,” Credences 3.3 (Fall 1985): 163. George Hartley, “Sentences in Space,” Temblor 7 (1988): 91. Stephen Fredman, The Poet’s Prose (Cambridge: Cambridge UP, 1983) 144. Barrett Watten in the introduction to Tjantingpoints to this sense of the oral in this really long poem which as we saw earlier progresses geometrically through nineteen paragraphs to arrive at the last one that contains seventy five pages. David Bromige, “A Note on Tjanting,” The Difficulties 2.2 (1985): 69. See Larry McCaffery & Sinda Gregory, “An Interview with Ron Silliman,” Alive and Writing (Urbana: U of Illinois P, 1987) 247. Ron Silliman, “I Wanted To Write Sentences,” Sagetrieb 11.1-2 (Spring-Fall 1992): 13. Manuel Brito is Associate Professor of American Literature at the University of La Laguna. 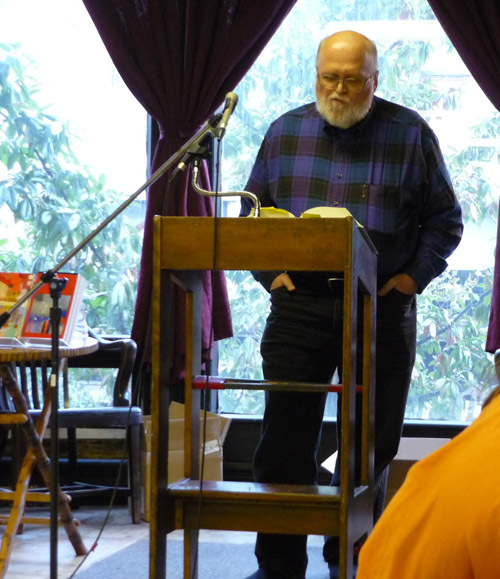 He has extensively published on contemporary American poetry. He is the editor of Zasterle Press and the magazine, Nerter. Currently he is working on small presses of innovative poetry in the United States.